The APV Panel Feeder/Stacker, combined with automated lift tables, makes a simple yet effective solution for feeding and positioning parts according to applications. A stack of panels raises up on a scissor lift then a moving arm with suction cups picks the top panel and moves the said panel into a feeding pinch roller mechanism to pull the said panel from the stack over a belt or roller conveyor. After releasing the panel, the moving arm retracts to pick up the next one. At the end of a roller or belt conveyor, a moving arm with suction cups picks the panel and moves the said panel into the stacking area over the scissor lift. After releasing the panel, the moving arm retracts to pick up the next one. 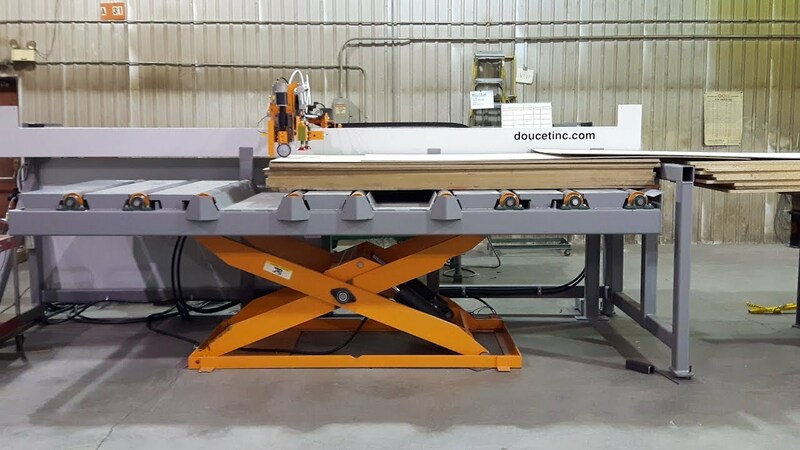 The panel lands over a scissor lift table that indexes down automatically when receiving panels.